Zooming through the thin layer of decaying leaves, plant parts, and soil beneath our feet, nineteen poems in a variety of verse forms with accompanying science notes take readers on a decomposer safari through the “brown food web,” from bacteria to tardigrades and on to rove beetle predators. Award-winning author Leslie Bulion and illustrator Robert Meganck provide more insight into the inspiration behind and the creation of Leaf Litter Critters. Q: Leslie, you were trained in oceanography and social work before becoming a writer. When and how did you decide to write children’s books? Does your background influence your writing? LB: Ah yes, you caught me—I’m a professional career-changer! But my life-long fascination with science, work as a school social worker, and experiences as a kid and parent all inform my process as a children’s writer. A childhood friend (who is a writer and former magazine editor) had a tremendous influence on my decision to write—in fact, it was her idea! Q: Robert, did you always know you wanted to be an artist? How did you get into the world of children’s illustration? RM: Basically yes. From the time I was very young. Drawing is something every child loves to do. I stuck with it not because I was good at it, but because I was bad at everything else. I suppose I got into children’s books the same way most children’s illustrator do—I read countless children’s book to my three children (now grown), now I read them to my grandson, and with each I imagine what I would do if given the chance. Q: Leslie, You’ve written multiple other nonfiction books in verse. Why do you choose a verse-and-poetry format when presenting scientific information instead of the more traditional format of nonfiction? LB: Well, that line of work—science poetry—all started when I took a week-long entomology field camp for adults at Cornell’s Adult University. I was learning so many amazing science stories about insect adaptations, and it struck me that insects are brilliant, small packets of evolutionary information, and poems are small packets of a different kind of information—ideas, emotions, moments; I wondered what would happen if I tried to put the two packets together. My fourth-grade teacher, Mrs. Brownworth had long ago set me on a poet’s path, so I set out again with science and nature in mind. Q: Why did you choose to examine the bugs that live in the leaf litter instead of other ecosystems where bugs live? LB: My first science poetry collection, Hey There, Stink Bug, was a more general survey of insect adaptations. But in that entomology field camp I mentioned, we spent a couple of days playing with a Berlese funnel—a contraption to sift out litter critters for examination. I have a field notebook full of microscope-view drawings of critters many folks haven’t heard of, so I wanted to revisit those. I love the idea of an ecosystems view, and I’ll be doing more of that. Q: You dedicate Leaf Litter Critters to kids who “can’t resist turning over a rock.” Were you an adventurous and curious child? LB: I think all kids can be adventurous and curious in many different ways. I had endless opportunities to explore outside when I was young—hours of free play, family camping and lots of time at the seashore. I was always digging, sifting and fishing for critters. Q: Robert, what part of Leaf Litter Critters did you most respond to when working on the illustrations? RM: As an editorial illustrator for many years, I’ve always loved the process of visually interpreting text material. Leslie’s poems are wonderful and really lend themselves to illustrations. Additionally I think the Peachtree team is great. They gave me a free hand to work through each piece the way I felt best. No one on the team ever made a single comment or correction that did not result in an improvement. Q: Leslie, what is your writing process like? What is the editing process like for poetry? LB: Process is a long question, so I’ll go for an overview: I begin with lots of background research. I read widely (the inimitable Melissa Stewart taught me that helpful process description), then I get more specific as I zoom in on the collection’s themes and select individual subjects for the poems. I put myself through a poetry self-study before the first collection and I’m still always learning. I use hands-on learning to immerse myself in the sensory experience. So fun! And essential to my writing. I also ask scientists I meet in the field to read my manuscript to be sure I’m spot-on with the science. By the time I pry the manuscript out of my own hands, I’ve shared it with my writers group and reworked the poems and science notes so many times. There’s always room to edit the notes, but the poems are trickier—you might ask my editor Vicky about that! Her editor’s eye is invaluable in every instance, and in science poetry she catches me if I’ve assumed an understanding readers won’t have. Otherwise, we end up talking about commas a lot! Q: What are some of the challenges of presenting scientific information through poetry? LB: Poems are short! I try not to have each poem be a mini-encyclopedia, so I tap into what I refer to as “cool science stories”—some aspect of behavior, appearance, life-history that POPs! Science vocabulary can have wonderful rhythm, and I find that inspiring. I explain a bit more in the narrative notes, but those are also concise. Q: How did you discover all of these creatures? What sort of research did you do? Did you ever see these critters in in real life during the writing process? LB: So much hands-on! I set up a laboratory in my basement and experimented with different collecting strategies and photography. I have lots of photos and videos of the critters I found. These observational experiences truly inform my writing—the collecting environment the colors, the backgrounds, the motion—and I hope readers will have some of these experiences, too. Q: Do you have a favorite leaf litter critter? LB: I’ll answer the same way I answer students during school or skype visits: favorites are HARD. I mean, what’s not to love about an inch-worming rotifer? Or a claw-waving tardigrade? Or a bendy rove beetle? Or a bacter—ok, maybe not some bacteria! I’ll admit, I’m pretty partial to the globular springtail I caught on film. Q: What about you, Robert? What critters were the most fun to create? Did you discover a favorite? RM: They are all fun. But if I was forced to pick my favorite it would probably be the pot worm. I had to add some visual reference so that the readers would get a sense of scale, so I added a Lego™ man with a fishing rod holding a goldfish cracker (both known scale references) and then added the pot worm on the Lego™ fishing hook. The fun thing, that few people will know, is that the fisherman is a self-portrait. Q: How did you work to make your illustrations fit with the poetry form of the book? RM: My complete portfolio varies a bit depending on the assignment and the audience. I chose to do these illustrations as black line drawing with a background color fill. This is a very traditional aesthetic for children’s books (Maurice Sendak, Beatrix Potter, etc. ), I just do it digitally. Q: What do you think readers can learn from the illustrations that they might not learn from the text? RM: Although I took some liberties with the scientific accuracy, I think the readers still get a sense of what the critters look like. They will also get a pretty good idea of scale when they look at the relative size spread. 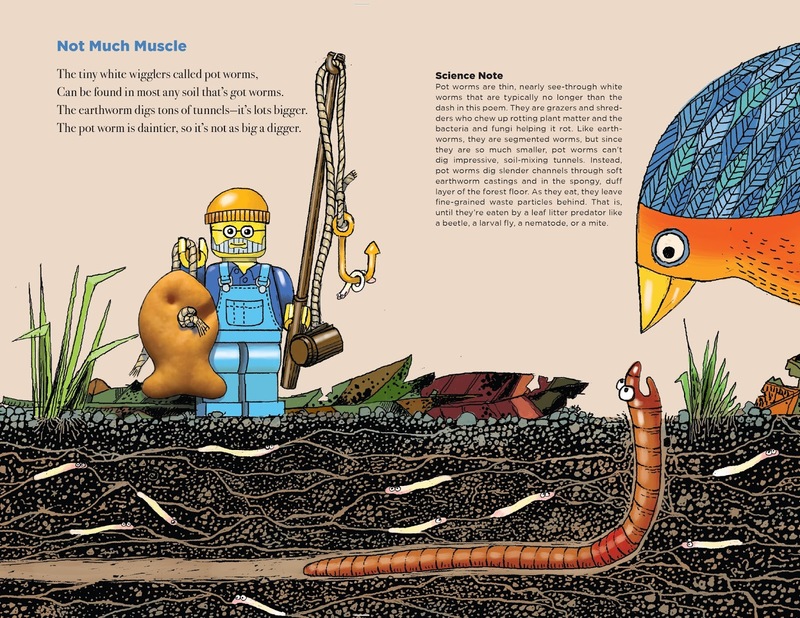 Q: The backmatter features lots of extra science and poetry information, as well as resources and activities. Leslie, how do you decide what to include in your back matter? LB: I always include resources for further reading, a science glossary, and a poetry glossary. Each reader is a unique learner who might be interested in one section or another. I love hands-on field study so much that I include suggestions for readers to enjoy those types of experiences, too. At NCTE in 2016 I met library media specialist Terry Young, who looked through a mock-up of Leaf Litter Critters and pointed out that readers would want a better idea of the relative sizes of the critters. Thank you, Terry—brilliant! That’s where Robert Meganck’s relative sizes spread was born. Q: How do you see educators using Leaf Litter Critters? LB: My HUGEST hope is that educators can find time to take students outside, collect a bit of soil or leaf litter, and take a close look at what’s there. We walk across this hidden world every day and it’s so cool and amazing. And it’s a great introduction to the ecosystem concept in miniature—all of these tiny critters with a specific job to do. And microscopy (or any kind of magnification) is so much fun! LB: I’m regularly bowled over by what readers find in my books—in everyone’s books, really! They teach me. But with each book, I hope readers will be inspired to spend time outside, take a closer look at the diversity in our beautiful world, and understand our responsibility to preserve and protect it. Q: What do you want readers to take away from your illustrations? RM: To simply enjoy them.